This article implements a fully customizable property grid as can be seen in the above screenshots. The grid supports various types of items: strings, combos, file pickers... It also supports fully customizable items that can define how they are drawn, how the user interacts with them and their behavior when edited. As developers, we are now all used to the Properties Window of Visual Studio and this article is an implementation of this. It does not support the help area and although the control supports different types of display (categorized, alphabetical...) standard buttons for this are not provided. The sample application provided shows almost all that can be done with the control. You are therefore encouraged to parse the source code to learn about the control! Basically, if the only thing we want to do is to display standard properties, then we are done! AddDateItem: a date value item chosen using a CMonthCalCtrl derived control. GetEditMode: tells the grid what kind of interaction your control is using when editing the value. 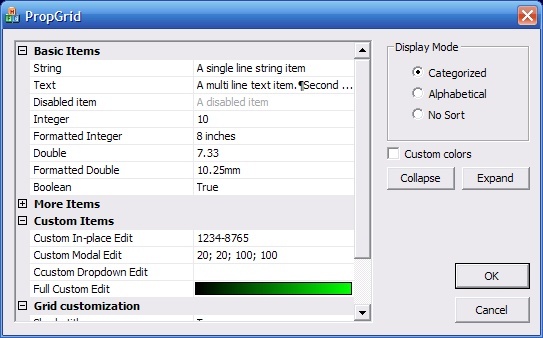 The sample application shows four custom items that implement the various edit modes. DrawItem: override this to draw your custom item. This can be as simple as calling DrawText on the provided CDC. Next, depending on the edit mode, you may override more methods to customize your item. To better understand how this works it is recommended to check the various custom items implemented in the sample application: CSerialItem for in-place editing, CRectItem for modal editing, CTreeItem for dropdown editing and CGradientItem for a full custom item. You can use the GetItemValue and SetItemValue overloads to get the value of a specific item. The HITEM expected is one returned when you called AddXXXItem when initializing your control. Make sure you call the good overload when calling this function: obviously you cannot get double from date item and you cannot set a LOGFONT in a text item. That's why all these functions return a boolean value indicating if things went well or not. I must warn you that this is some code that I wrote a while back and that has not changed much since. I always wanted to put this one on Codeproject but obviously did not find time to do it. Now it's done! I only provided project files for Visual Studio 2005 but I see no reason as to why the code should not work with 2003 or even 6.0. Maybe some minor adjustments should be done but it should not be a big issue. This was a fun control to write especially supporting full custom items. My description of the control does not cover all aspects of the control and I encourage you to review its header file to discover things that I have not taken the time to talk about. Nevertheless, I hope that this short article let you see all the possibilities of the control!